The top browsers have been put to the test by ITPro, the IT analyst. Chrome vs. Firefox vs. Microsoft Edge, as well as Apple’s Safari have been tested on an Acer Aspire V3-572G-7105 and a MacBook Pro. Security should be the highest priority of any individual who is browsing for information on the web. At the Pwn2Own 2017 event, a group of hackers were put to try and exploit the vulnerabilities of these browsers. The best browser in terms of security seemed to be Chrome, which could not be hacked, whereas Firefox was hacked once, Safari was hacked three times and Microsoft Edge turned out to be the least secure browser. By targeting the frame rates of complex scenes using the MotionMark benchmark, Edge came first followed by Chrome and Firefox. Speedometer benchmarks measure the responsiveness of web applications and Chrome was twice as fast as the next 2 browsers, Edge and Firefox. In terms of design and how aesthetically pleasing they are, Chrome seemed to come out on top. “Minimalist design, elegant and uncluttered”, as described ty ITPro, followed closely by Firefox. The redesigned Edge, having big boxy tabs, was the least attractive in comparison to the other two browsers. All three browsers have been optimized for mobile devices, but the way you transfer information from your desktop to your mobile device’s browser will make all the difference. Chrome was the winner again here as it was easy to set up and sync on any device, whereas Firefox would often crash on Android and Edge would come last as it is limited to specific platforms. We all know that browsers can’t work by themselves, so depending on how many extensions they can cope with, Chrome came out again in first place with the widest variety of extensions. Second was Firefox with less extensions but easy to use, whereas Edge was lagging big time when it came to extensions even though it is a newly built browser. 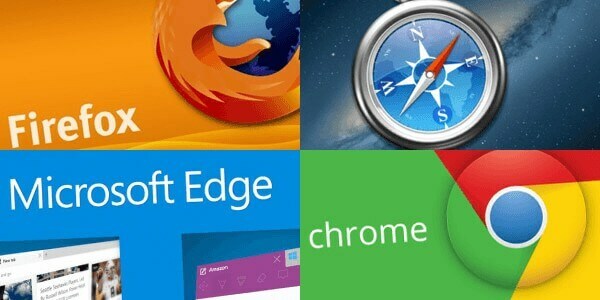 While Edge performed best in the benchmark tests on Windows based computers, Chrome performed better overall on both platforms (Windows and Mac OS), with Firefox never coming first, but coming second on three occasions. On Mac OS, Safari came first four times, losing only once to Chrome, as Firefox finished last in all tests. While many of our clients are used to Internet Explorer and then moved on to Edge as it came built into Windows 10, we would strongly recommend using Chrome and Firefox for our applications. Even though Edge performed better in some areas, it is lacking extensions which are so needed for running all the operations. As a conclusion, we definitely do not recommend using Internet Explorer for Just Ship IT, as we’ve had reports of missing orders, broken buttons and bad responsiveness on our application, so our obvious choices here would be Chrome and Firefox.